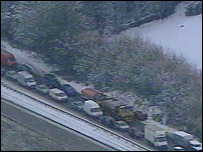 Hundreds of people have spent the night away from their homes after five inches of snow brought chaos to Cornwall. About 1,000 motorists had been trapped on Bodmin Moor but police say all had managed to move off or find a bed. Many children were stuck in their schools for much of the evening and some were forced to stay in friends or teachers' homes. Seven military aircraft have been on standby and heavy lifting vehicles have been brought in to move abandoned cars. The Territorial Army has been asked to help people from their vehicles and helicopters carrying blankets were also flying to the area. About 500 vehicles, including coaches, were stuck on the A30 between Kennards House and Bodmin near to Jamaica Inn. Devon and Cornwall Police said the A30 eastbound has reopened and was "passable with extreme caution", but the westbound carriageway remained closed. The A390 was still blocked, but the A38 has reopened, police said. Inspector Sean Pepper, of Devon and Cornwall Police, said everyone has been rescued from Bodmin Moor and 20 vehicles were left abandoned on the A30. "The area has been swept with thermal imaging and we believe no one is left in any vehicles left abandoned on the road," added Mr Pepper. A Ministry of Defence spokeswoman said: "As part of the joint effort between the RAF and the Navy, two helicopters carrying blankets are being sent from St Mawgen to Bodmin where a centre has been made available for drivers stuck in the snow." More than 100 people were taken by coach to the Wadebridge Leisure Centre and 350 people were expected to sleep at the Dragon Leisure Centre, in Bodmin. There were no reports of anyone being injured although many drivers were angry and frustrated. Many children were trapped at school during the evening. But a spokeswoman for Cornwall County Council said: "We won't have any children sleeping in schools tonight. "They have either been able to get home or they are staying with friends locally, or in one case in a local hotel." More than 300 pupils from one school, Treviglas Community College in Newquay, were rescued by tractors and four wheel drives by friends and family after becoming snowed in. Fifteen pupils, aged 15 to 18, are spending the night in nearby hotel The Grantham Astor, along with three stranded teachers. Deputy head teacher Malcolm Broad said: "They are the older students. We have managed to get most of the younger students home." The Royal Cornwall Hospital in Truro put out an urgent call for nurses, midwives and health care assistants to cover shifts overnight and on Saturday. The NHS has asked the public only to contact hospitals in emergencies and use NHS Direct wherever possible. 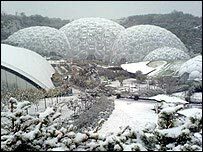 The Eden Project was forced to close for the first time. Newquay Airport was also closed as were more than 70 schools across Devon and Cornwall. Rail services on the Par to Newquay branch line were suspended while fallen trees blocked one of the two tracks, causing delays to First Great Western services between London Paddington and Penzance.